When I started primal/paleo eating November 2013 I stopped eating potatoes – well I switched to sweet potatoes. Now don’t get me wrong I love sweet potatoes so it was no hardship. However there is a family dish that I generally make during the summer and always make on Christmas Day (NZ Christmas is in the summer! 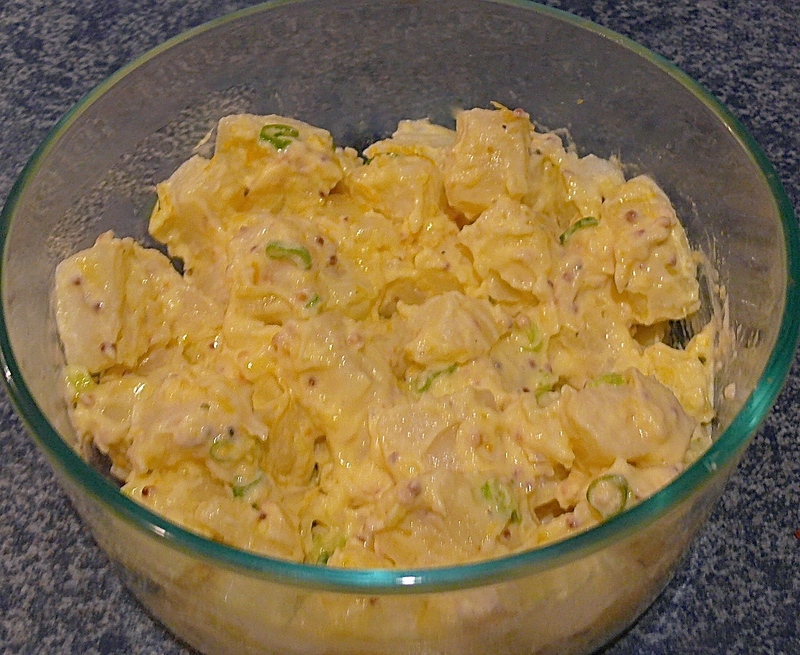 ), Potato Salad. So being new to the lifestyle and with the whole family embracing primal eating, that ended up being Sweet Potato Salad – a different dish entirely. Then there was the mayonnaise – store bought full of revolting seed oil and my attempts at homemade were really not good. A couple of things have happened since then. I learned about the gut feeding qualities of resistant starch, I discovered that cooked and cooled potatoes fall into this group of starches. The second thing was I found that the key to making homemade mayonnaise that tasted yummy was to use a light tasting olive oil. It did take me a while to click into these two separate discoveries, and think Potato Salad is on the menu again!! It’s now Spring in New Zealand and time to start thinking about outdoor cooking and cold salads. So here is my so simple it’s silly, Potato Salad – I hope you enjoy it as much as my family does. Add cooled potatoes and spring onion (scallion) to a mixing bowl. Carefully fold the mustard mayonnaise. Refrigerate for at least 2 hours, just before serving gently stir.